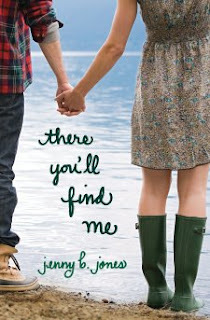 There You'll Find Me by Jenny B. Jones is a wonderful story of grief, guilt, forgiveness and love. Eighteen-year-old Finley Sinclair books her trip to Ireland as a foreign exchange student. Her mission is to get some answers from God who, since her brother's death, seems to have forgotten her. She wants to let her heart heal, see the sights her brother held so dear, and work on her college audition piece for a music conservatory. Her plan is to use her brother's journal from his time in Ireland as her guide, tracing his steps throughout the country. But from the moment she sits down on the plane next to Beckett Rush, teen star of the hottest vampire movies, nothing goes according to plan. The beauty of Ireland surrounds the chaos that becomes Finley's life. As she works to control her life and fill the void left by her brother secrets from her past refuse to stay buried. When it all falls down Finley must figure out how she can give her past, her hurt, her emptiness to God, if she can ever hope for a future. I first stumbled upon Jenny B. Jones in a bookstore where her book Save the Date was on sale, and immediately fell in love with the characters and the writing style. When I found out Finley was getting her own book I knew it was another book I had to read. I loved this story. I enjoyed the main characters, the way the story flowed with the music (that will make more sense when you read the book), and the overall message. The story of grief, loss and guilt is one that many people can relate to. In this book, Finley is no different from a lot of people in the way that she handles those emotions. Jones does a wonderful job of sharing a young woman's struggles with loss, death, hope, love, forgiveness and healing. Thomas Nelson graciously provided me with an e-copy of the book for review purposes. All opinions of the book are my own, and I am under no obligation to write a good review. It sounds like a wonderful book. I'm not sure i can get a hard copy in Kenya, where can i buy the e-book? Barnes and Noble and Amazon both have e-book copies available.